In inbound marketing, an offer (or content offer) generally refers to a piece of gated content that’s offered in exchange for a site visitor’s contact information. Offers convert visitors into leads, and can also be used to nurture those leads into customers. A good content offer meets a lead right where they are in the buyer’s journey—lending education about your industry, product, or company. For example, after reading a blog post a prospective buyer may be prompted by a call to action (CTA) promoting a download. Upon clicking the CTA, readers are brought to a landing page where their offer awaits. To access it, the reader must fill out some personal/contact information. Content offers are your foremost lead-generation source. Not only do they turn website visitors into actual contacts, they are one of your strongest tools for lead nurturing—you know, the kind of outreach that turns website contacts into marketing and sales qualified leads. Content offers also position your company as a subject matter expert and industry resource by hitting prospects with content that fits their needs when they need it. In general, offers fall into three categories: top of the funnel, middle of the funnel, and (you guessed it) bottom of the funnel. These categories are representative of the buyer’s journey. At the top of the funnel, you have people who have just entered the “awareness stage.” They’re looking for educational resources to articulate or solve a challenge. Top of the funnel prospects love tools like how-to guides, templates, checklists, and videos. Middle of the funnel buyers have traveled a bit further on their journey and already have some knowledge of the problem they are looking to solve. They’re looking to dig a little deeper into a subject with detailed information and comparative metrics. They might be drawn to email or webinar series, case studies, and comparison charts. And lastly, bottom of the funnel buyers are in the decision phase and ready to make a move. These prospects are interested in demos, discounts, consultations, and the like. 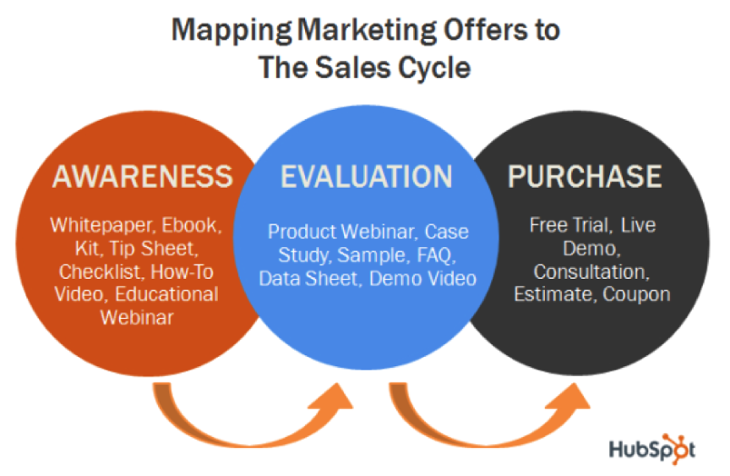 HubSpot’s graphic on mapping marketing offers to the sales cycle does a great job of laying this out. Offers are a way of nurturing a prospective buyer, rather than hitting them with everything all at once, which can lead to users feeling overwhelmed or confused. The first step in successful content offer planning is to meet prospects where they are. That’s why we always plan offers according to the buyer’s journey—and recommend that you do the same. In addition to the funnel stages, buyer personas play a major role in creating offers. But you already knew that, right? Each of your offers should be mapped not only to their relevant funnel phases but also to their relevant buyer personas. Sure, some offers will overlap personas. But without a clear picture of who you’re creating content for, what challenges they need to solve, and what goals they’re looking to accomplish, you’ll find your content offers quickly collecting dust. An offer is any piece of content put behind a landing page and form that is given to a lead in exchange for information about themselves.